I remember playing football in university, challenging in various competitions, winning some & losing some. I remember one tournament in particular; we had gone all the way to the finals and were 1-0 up with a few minutes to go. A rare attack from our opponents saw our one of our defenders, the right back, isolated 1 v 1 with a forward from the other team. What happened next was something out of a comedy special. This right back, fully aware that he could easily be beaten for pace as he wasn’t the quickest, backpedalled with extreme discomfort. Then with his arms waving in a frenzied manner, began to cry for help. He was of course easily skinned by the front man who luckily, was a better dribbler than a shooter and spared the fullback’s blushes. Watching from afar (I played as a forward) it frightened me momentarily to know that all our hard work could have been undone by a weak link in defence. My respect for the defenders who battle valiantly to ensure that their teams come out victorious grew exponentially from that day. Thus, as we idolize the swashbuckling fancy footed forwards constantly getting accolades for their performances, it is important we remember the warriors. The defenders who give the magicians the freedom to weave their trickery. Here’s an ode to some of the best defensive setups that have ever won the World Cup. It’s an unexpected name to begin the list with, Brazil is known for a gung-ho approach to games. 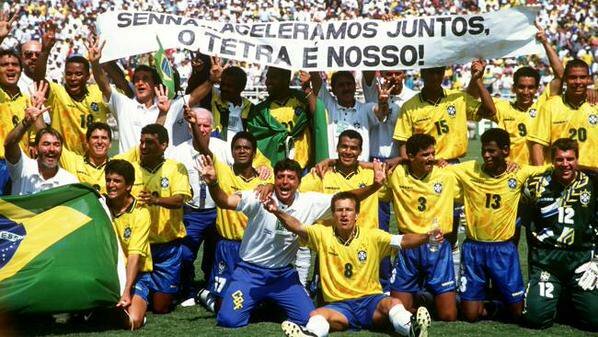 Their Joga bonito style was put on hold for the 1994 World Cup, however, as their clear intent to play a more reserved game resulted in them conceding just three goals in seven games at the tournament. They claimed the ultimate prize on Penalties. Their defenders included Jorginho at Right Back, Ricardo Rochas and Márcio Santos at Center back and Leonardo at Left back. They were only together for 69 minutes, however, as an injury to Rochas in the first match against Russia ruled him out of the rest of the tournament. He was replaced quite adequately by Aldair who played every single minute of the campaign afterwards. The only other changes came after the round of 16 when Leonardo got sent off against the USA. He was replaced in the starting line up from the Quarterfinals to the final by Branco. Cafu also made notable appearances in the quarterfinal, semifinal and final coming on as a substitute each time. Brazil kept five clean sheets failing to do so against Sweden in their final group game which they drew 1-1. Against the Netherlands in the Quarterfinal, they conceded two goals to a hugely talented Dutch squad including members of the Ajax UEFA Cup and Cup Winners Cup squads. The Iberians had an inauspicious start to their successful World Cup campaign, becoming the first and so far, the only team to survive an opening match loss to win the World Cup. Their 1-0 loss to Switzerland was one of only two matches they conceded in. The other, their 2-1 win over Chile in their final group stage game. They went through the rest of the tournament unscathed and were able to shut out Portugal, Paraguay, Germany, and Netherlands. Boasting defenders like Joan Capdevila, Carles Puyol, Gerard Piqué and Sergio Ramos, they remained largely the same throughout the tournament. The only other defenders making appearances at the finals were Carlos Marchena who came on as a substitute three times (in all the knockout games bar the final itself, he played less than 10 minutes in total), Alvaro Arabella’s also made one appearance. He replaced Sergio Ramos after 77 minutes against Honduras in a group stage match. Spain’s defence had the added advantage of being imbued with excellent ballplayers, aiding their possession-based gameplay at the World Cup. In the absence of their talisman Zinedine Zidane, suspended for two games, France had to rely on an exceptional defence and goalkeeper to survive. Even though the midfielder came back for the Quarterfinal against Italy, France continued to show excellent defensive discipline throughout the rest of the tournament. Their biggest moment of defensive triumph being their 3-0 victory over Brazil when they stifled the most feared attack in the world at the time. France’s defenders on home soil were Lilian Thuram, Marcel Desailly, Laurent Blanc and Bixente Lizarazu. They switched the formula voluntarily once in their final group stage game. In this game, they let in one of only two goals conceded throughout the tournament. Despite using back up fullbacks Frank Leboeuf and Vincent Candela, they still won 2-1 against Denmark but reverted to their usual back four in the first knockout game against Paraguay. They continued with their chosen four until the semifinal when they conceded a second goal of the tournament after a mistake from full-back Thuram. He duly restored his dignity by scoring 2 goals to win the tie for France. The change was forced on them when captain Blanc got sent off in the dying embers of the match and was replaced in the lineup for the final by Frank Leboeuf. Arguably the most dogged showing of defending by a World Cup Champions had to be the masters of catenaccio. Italy at the World Cup in Germany was near impregnable. Featuring the eventual 2006 World Player of the year Fábio Cannavaro, the Azzurri was superb as they protected their goal, conceding only twice. The first in a group game against the USA from an innocuous own goal from Cristian Zaccardo who was immediately dropped after the game for Gianluca Zambrotta and the second a penalty in the final against France from the penalty spot. Their defenders lined up with Zaccardo at right back, Cannavaro and Alessandro Nesta at Center back, and Fábio Grosso (who got their winner in the semifinal against Germany and scored the winning penalty in the final against France) at Left back. An injury to Nesta and Zaccardo’s unconvincing display against the USA led to the inclusion of Marco Materazzi and Zambrotta. Materazzi would later become famous for scoring in the final and being on the receiving end of Zidane’s headbutt. He was replaced in the starting line up by Andrea Barzagli for the quarterfinal against Ukraine after getting sent off against Australia in the round of 16. The match against Ukraine also saw the introduction of Massimo Oddo and Zaccardo as substitutes to bolster the defence. Italy managed shutouts against Ghana, Czech Republic, Australia, Ukraine and Germany and did not concede a single goal by an opposition player from open play. Talk about a mean defence. It’s interesting to see most of these groups of defenders being from an era when people claim that the art of defending has died. Perhaps it hasn’t, we might even be in store for more glorious displays of valiant defending in Russia. Who knows?